Home » Posts » Blogs » Get On Your Bike With Laser Eye Surgery! Get On Your Bike With Laser Eye Surgery! What a year it has been for cycling! First we had the amazing Giro d’Italia with Northern Ireland literally turning pink for several days followed by the yellow themed Tour de France with the Grand Depart 2014 in Yorkshire. The cycling renaissance has well and truly begun with renewed interest and passion in competitive and recreational cycling across the entire country. It may be all well and good purchasing a magnificent bike with all the necessary safety gear but what about those of us who wear glasses? Many cycling blog posts tell stories of how wearing prescriptive glasses bring their own set of problems whilst cycling, whether that be watery, streaming eyes or attempting to cycle without prescriptive glasses; a situation which is most definitely not recommended. The problem with attempting to wear glasses whilst cycling is that they do not provide full peripheral vision, this presents a real danger leaving the cyclist unable to see pedestrians or traffic coming behind, furthermore cycling in the rain will completely distort vision as the rain hits the lenses, whilst at night cyclists are faced with severe glare problems. Whether cycling in a competitive field, for recreational purposes or for commuting, cycling with prescriptive glasses presents a variety of dangers. 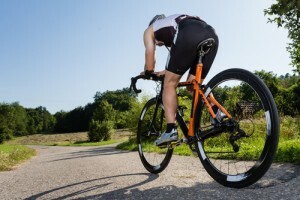 At Advanced Vision Care, we recommend Laser Eye Surgery for cyclists and other forms of sports as a corrective vision procedure with outstanding results whereby patients can achieve driving standard vision, a remarkable comparison before and after surgery. Laser Eye Surgery at Advanced Vision Care offers a complete life changing experience; quality of life is completely enhanced and activities such as cycling can be enjoyed at its best! As soon as you open your eyes following the procedure you will be amazed at how your vision has changed. Following a few days healing your new sight and clear vision will leave you wondering why you waited so long for this life transforming procedure. The most popular Laser Eye Surgery is Lasik, and indeed it is the most popular laser eye surgery for those who come into contact with sport. Lasik is a procedure for long sightedness and short sightedness. The procedure involves reshaping the cornea to allow light that enters the eye to be properly focused onto the retina for clearer vision. It is a blade free surgery with little discomfort and offers a fast recovery time. For further enquiries about Lasik Laser Eye Surgery, contact Advanced Vision Care and arrange an appointment with our specialist eye surgeons.